November 1-10, 2019. The largest of its kind in the world, The Royal Agricultural Winter Fair is a full day of fun with family entertainment in the PC Animal Theatre featuring Spirit of the Horse; rabbit jumping; sheep herding and the PC Super Dogs. Plus you can see giant vegetables, butter sculpting, explore the world of grains, find out how greenhouses work, make your own seed planter, sample the fruit/vegetable of the day, find out how to make an urban garden (even on a balcony), discover how tasty bugs can be, explore the farm to table story and sample creations from top chefs. 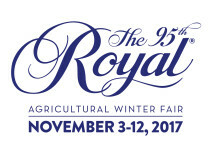 With over 350 unique vendors and over 5,000 animals competing in world class livestock competitions plus the Royal Horse Show, voted #1 indoor horse show in North America, there’s alot to see, do, taste and try at The Royal.